In many ways we have come complacent to the process whereby corporations with their headquarters somewhere far away decide how best they want to handle the property they acquire in what should be your own community. to invest some development money into a Regina hotel on South Albert Street. It is a smaller but solidly built concrete building that has had a tough time in the competitive hotel business in Regina. The debts mounted up and the Ochapawis band sold their debt ridden property to a developer. The developer doesn't want a hotel but wants instead to put up a strip shopping mall. Hence a perfectly good and sturdy building is being knocked down to make way for more strip mall space in a city which already has more mall space than is being used. As part of its move into Canada Walmart purchased the Woolworth's Woolco Empire converting the vast retail floor space into Walmart stores. But Walmart's marketing strategy has always been to locate on the edge of cities separating themselves from other markets and often allowing them to set their own store hours. Gradually all across Canada they have been moving out of their former Woolco buildings and putting up new Walmarts leaving behind empty retail space which had formerly been the anchor for that shopping mall. 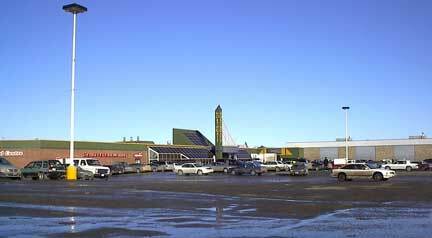 These pictures show the vast empty parking lot at Regina's Northgate Shopping Centre. 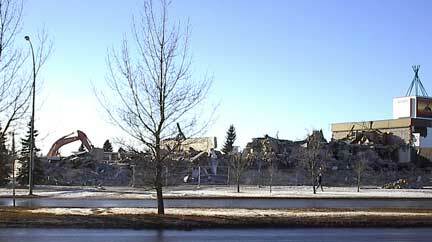 Albert Street which forms the central market place for Regina is clearly under attack. Last year SuperStore abandoned its centrally located store at Dewdney and Albert and moved to the Eastern outskirts of the city leaving the city's core without a major supermarket. Developments like these are not determined locally or even by the demographics of a community but in board rooms and marketing departments in far away places. But the result is seen and felt directly by the people in the community. We often are disturbed at the external forces that brutally upset rural Saskatchewan but from this story you can see that these same forces hammer the small market urban centres like Regina in a similar though different manner. Common sense would suggest that some one wanted to develop a mall in Regina should do so in the now empty Northgate Shopping Centre or the abandoned SuperStore but instead the developer bought and destroyed a well built functional hotel a mile away. Many would point out to me that this is the nature of a free capitalist system but consider who pays for this kind of waste. One way or another the individual consumer and taxpayer foots the bill for all waste. The value of the hotel is lost and the taxpayer foots the bill for the rubble being placed in an overburdened landfill site. It seems foolish to the community at large to have development involve one step forward and two steps back.